The Canada Reads: True Stories panel has chosen Something Fierce: Memoirs of a Revolutionary Daughter by Carmen Aguirre as the winning book, after a controversial four days of debate. CBC’s annual battle of the books wrapped up Thursday, with three votes for Something Fierce, and two for The Game, the other book still in the running at the beginning of the morning's debate. 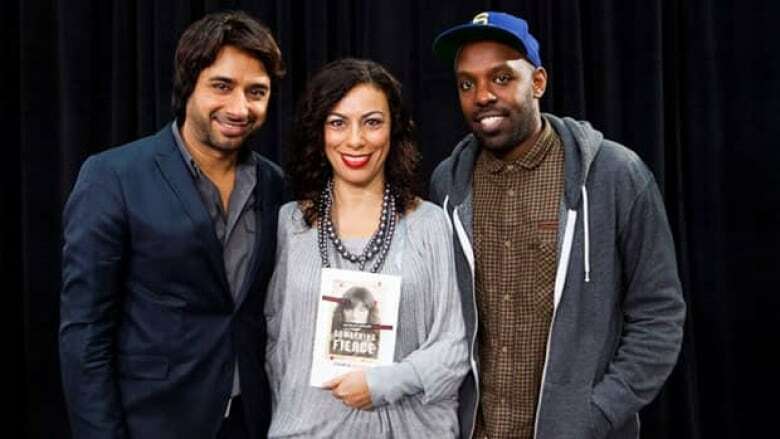 Panellists Anne-France Goldwater, Arlene Dickinson and the book’s defender, Shad, voted for Something Fierce. The non-fiction book is Aguirre’s memoir of being taken from her home in Vancouver by her mother, who was part of a revolutionary movement opposing Augusto Pinochet in the 1970s. Aguirre grew up amid political struggle, torn in her teen years between boys and pop music, and political activism. Rapper Shad said he found Aguirre’s story compelling and defended both its portrayal of complex family dynamics and a youth spent amid struggle. "I think what I tried to get across every day was how layered it is, and it's funny because they played a clip today of Carmen’s mother talking and she said it better than I did in all those days," Shad said in an interview with CBC News after the debate. "She pointed to everything that the book is about – a complicated family story, a coming-of-age story. It’s funny, it’s obviously brave, it talks about very real feelings that people go through, anybody living in these circumstances – the fear and living with state terror. Not just being a revolutionary but what it’s like to live in a brutal repressive regime." The other book that had still been in the running during Thursday’s debate was Ken Dryden’s The Game, a memoir of the 1979 Montreal Canadiens hockey season, defended by actor Alan Thicke. Aguirre, who is preparing for the one-woman show, Blue Box, to be staged at the Great Canadian Theatre Company, said she listened to the Canada Reads debate from her hotel room in Ottawa. "I’m in a state of shock. What I want to say is ‘Shad I love you,’" she said after her win. "It has been an absolute honour to be in the company of the four other books, which I read very quickly. They were great." Aguirre will be a guest on CBC’s cultural affairs show Q on Friday, along with Shad. Goldwater, the Quebec family lawyer who stirred controversy earlier in the week by referring to Aguirre as a terrorist and questioning the truth of another book, Marina Nemat's Prisoner of Tehran, said she came into the final Canada Reads discussion undecided. "The challenge for us is if we are ready to set aside our preconceived notions about these books, open our ears and listen to the debate," she said. In an interview with CBC's George Stroumboulopoulos, Aguirre said she was not angry at being called a "terrorist," reasoning that Goldwater was talking about the person portrayed in the book, not the person she is today. "Many of the people I admire in history — whether it be Latin American or world history — have been called terrorists," Aguirre said, adding "If I'm in the same league as [Nelson] Mandela, that's a very big compliment." Shad weighed in on the controversy in off-air comments, saying Goldwater used "not necessarily responsible language" in her references to the authors. He said he sympathized with Nemat, who was referred to as untruthful. "You can’t argue with someone’s experience. When you read a personal story, you put away that part of yourself that’s judging and you say, '"Let me hear that story, let me hear that experience,'" Shad said. "Some of the words she [Goldwater] chose on the first day might not have been responsible. Some of the charges against Carmen could be dangerous. She has a child and that’s a pretty loaded word – a lot of people feel strongly about that word and so there might be a safety issue." But he defended the tone of the Canada Reads debate and Goldwater's right to express her opinion. "I was glad we had a space for those conversations. I was so excited ... to be part of that, modelling how you can have civil discourse with different views and different perspectives and different experiences. I especially enjoy when people are being honest about where their opinions come from," he said. This Sunday, Canada Reads will air on CBC-TV as an hour-long recap special presenting the highlights from this year’s debate at 1 p.m. ET (1:30 NT). An hour-long special will also air on CBC Radio One on Saturday, Feb. 11 at 4 p.m. (4:40 NT) and Sirius Satellite Radio 159 at 2 p.m.